New Year, same old story. 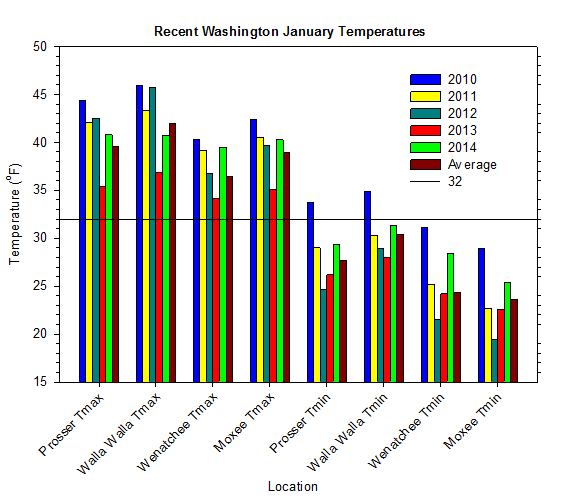 The dry and uneventful winter conditions of late 2013 persisted into January, although Washington's temperatures were much warmer than in December. A dirty ridge dominated the weather for much of the first 10 days of the month, and only allowed weak weather systems to pass through Washington. Stormy weather made a brief appearance during the second week of January, and delivered some rain to the western lowlands and snow to the mountains. In fact, 2 inches of rain fell at Poulsbo South on the 11th. Meanwhile, eastern Washington was windy and warm. A mountain wave event on the morning of the 10th caused winds to gust as high as 64 mph at Wenatchee Heights. As windy conditions and strong mixing continued, temperatures reached into the upper 50s to mid 60s in parts of eastern Washington each day from January 11th to the 13th. Conditions quickly calmed around mid January, as a strong ridge of high pressure became established for most of the latter half of the month. In the lowlands, cool, stagnant conditions and poor air quality were the unfortunate consequences of the stable pattern, along with small diurnal ranges. 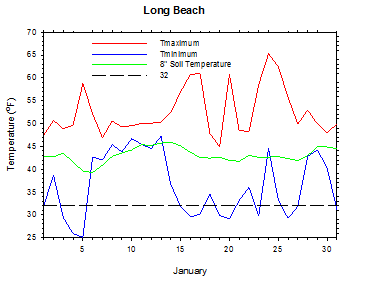 By contrast, periodically sunny and dry conditions allowed Long Beach to reach into the 60s on several days in late January. However, somewhat more active weather returned again at month's end, as 1.95 inches of rain fell at Stevenson on January 29th. 2014 began with high temperatures in the 40s in many locations, although areas that failed to mix out of the inversion only climbed into the 30s. Lows were mainly in the 20s in the east, and 30s to low 40s in the west. A few hundredths of an inch of rain fell in some places, although many locations remained dry. Notable rainfall in excess of one inch occurred on the 2nd in parts of Whatcom County. However, cold lows returned on January 4th and 5th, as dry high pressure re-established itself over Washington. Clouds increased on the 6th, which capped high temperatures in the 30s or lower in eastern areas. Significant rain of up to 0.6 inches fell in western areas on the 7th, as light wintery precipitation affected eastern areas. Another garden variety weather system brought more western rain and east side mix on January 8th. Highs were around 50 degrees in the west, and mainly in the 30s in much of the east, with lows in the 40s in the west, and 20s to low 30s in the east. 0.91 inches of rain fell at Underwood, as significant rain fell across much of western Washington, and the Idaho border areas of eastern Washington. A mountain wave wind event on the 10th caused wind gusts of up to 64 mph at Wenatchee Heights, as well as strong overnight warming. Morning temperatures were already in the 50s in south central Washington. An inch of rain fell at Montesano, with wet weather across all of western Washington. Highs on the 11th again reached the 60s in parts of south central Washington. Daily average wind speeds were as strong as 29 mph at Huntsville, while wind gusts of 63 mph were recorded in the morning at St. John. 2 inches of rain was recorded at Poulsbo South, and heavy snow fell in the Cascades later on the 11th and into the 12th. Conditions began to calm a bit on the 13th, and the high temperature reached a balmy 65 degrees at Ellisforde in north central Washington. Lows were in the 30s to around 50 degrees, with lingering light rainfall at some western sites. Fog increased in coverage on the morning of the 17th, with temperatures in eastern areas ranging from the upper teens to the 30s. High temperatures reached the 30s and 40s in the east, and 61 degrees at Long Beach. As low clouds enclosed most of central and eastern Washington on the 18th, stagnant air and small diurnal swings became the rule for the next week. High and low temperatures stayed mainly in a narrow range from the mid 20s to mid 30s in the eastern lowlands. Despite a little light rain in western areas on the 21st/22nd, the anemic weather system did little to ameliorate the stagnant drought conditions. Highs on the 24th and 25th reached 65 and 62 degrees, respectively, at Long Beach. The pattern finally began to change at month's end. A weather system on January 28th and 29th brought some rain to western areas, and eliminated the inversion in eastern areas. Southern and central areas of western Washington received upwards of a half-inch of rain on the 28th. A daily rainfall total of 1.95 inches was observed at Stevenson on January 29th. Meanwhile, eastern Washington received a variable winter mix of rain, snow, sleet, and freezing rain. 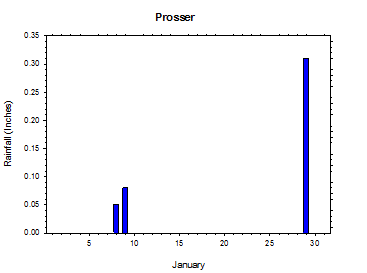 The average January temperature at Prosser (WSU IAREC) was 34.2°F, which is 0.8 degrees above average. The average high temperature was 40.8°F, which is 1.2 degrees above average. The average low temperature was 29.3°F, which is 1.7 degrees above average. 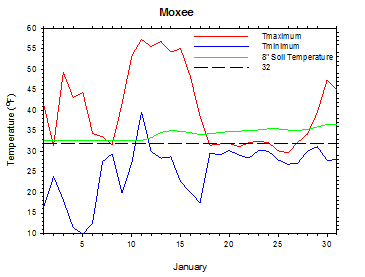 The maximum temperature recorded last month was 56.7°F on January 12th, while the coolest daily high was 30.3°F on January 26th. 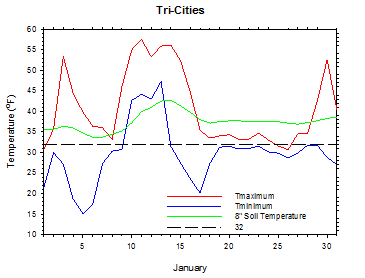 Low temperatures ranged from 43.3°F on January 13th to 16.8°F on January 5th. Daily average temperatures ranged from 48.8°F on the 11th to 26.2°F on the 5th. The monthly precipitation total was 0.44 inches. 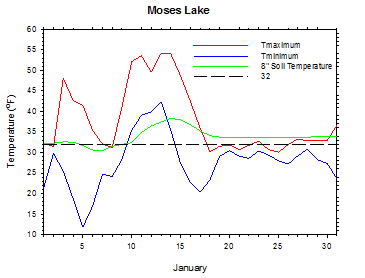 The average wind speed was 3.6 mph, and the average 8 inch soil temperature was 38.9°F. 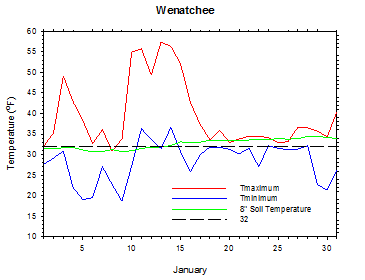 Wenatchee (WSU TFREC) recorded an average temperature of 33.7°F, which is 3.8 degrees above average, while Walla Walla's average monthly temperature of 35.4°F was 0.5 degrees below average. 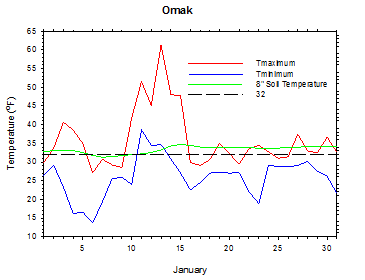 Omak was one of the cooler spots in eastern Washington, with an average January temperature of 30.8°F. In western Washington, Mt. 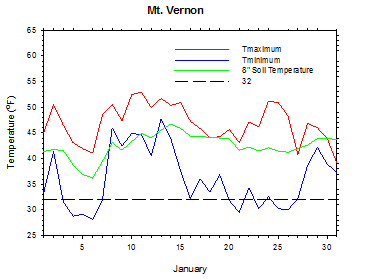 Vernon's average temperature was 41.0°F, which is 0.5 degrees above average. 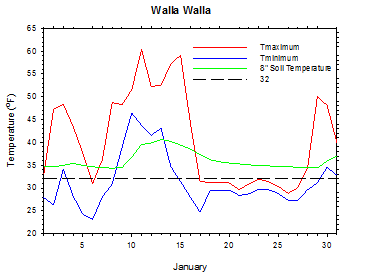 January 10th: The wind at Wenatchee Heights gusted to 64 mph during a mountain wave event. 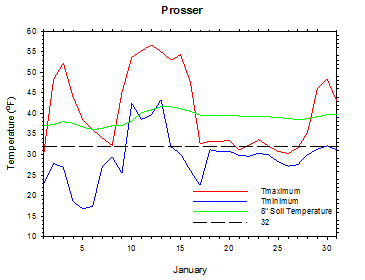 January 13th: The high temperature at Ellisforde was a mild 65 degrees. 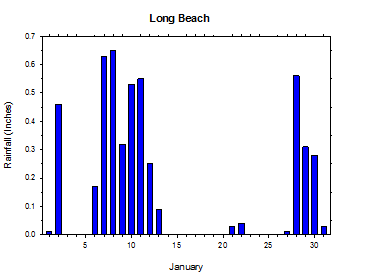 January 24th: The high temperature at Long Beach reached 65 degrees. January 29th: 1.95 inches of rain fell at Stevenson. January was another dry month for the most part. Although there were minimal reports of obvious crop damage, there were concerns about cold damage from the December cold spell (National Agricultural Statistics Service). 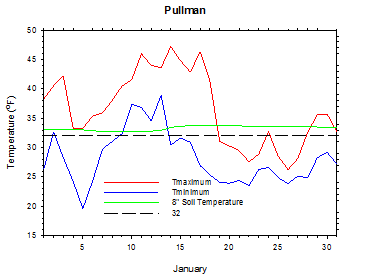 On January 26, 2009, the temperature plunged to -18 degrees at Pullman. According to the Climate Prediction Center, near normal conditions early in the spring will transition into warmer than normal temperatures from late spring and beyond, with a chance of drier than normal conditions for late spring and early summer.